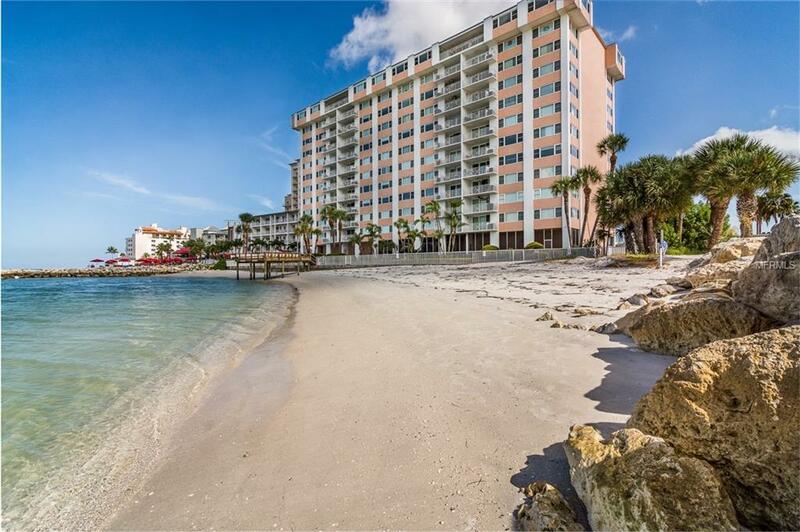 WOW...CLEARWATER BEACH 2800 SF PENTHOUSE! !This beautiful WATERFRONT Condo features water views from every window!Imagine seeing the sunrise from one side or the sunset from the other side!TOTALLY RENOVATED home that features 3 bedrooms...3 full baths..IN LAW SUITE..PLUS A DEN..2 ASSIGNED PARKING SPOTS..2 storage units..The kitchen is gorgeous & features solid wood cabinets,granite countertop,stainless steel appliances,designer lighting & backsplash,plus a large breakfast bar with views of the water.Sliders to large balcony from both of the living room& family room.Wet bar includes full size refrigerator/wine refrigerator/dishwasher & icemaker. The large master suite features large windows with GULF & INTRACOASTAL VIEWS,his & hers walk in closets,updated master bath with designer cabinets,mirrors,sinks & large walk in shower.The 2nd bedroom features water views & sitting area.Second bathroom features 2 sinks,granite & designer tile plus a shower/tub combo,3rd bedroom also features a waterview! The large Den could be used as a media room,office or workout room....the possibilities are endless!Large balcony to enjoy all of the waterviews,fireworks,sunrise & sunsets from this 12th floor penthouse.NEW IMPACT DOORS & WINDOWS.You will feel like you are on vacation all of the time with Large pool w/waterviews,private beach & fishing pier.This could make a great full time home,large vacation or 2nd home or could be used as a seasonal rental!Easy drive to airport & all attractions. Best VALUE for a GULF VIEW CONDO! Additional Lease Restrictions Applicant(S) Must Complete Application W/Fee Submit To Office. Amenities Additional Fees Please Contact The Listing Agent Regarding The Additional Fees.